In America today, there are 7.8 million Americans that are considered to be officially unemployed, and another 94.3 million working age Americans that are considered to be “not in the labor force”. When you add those two numbers together, you get a grand total of 102 million working age Americans that do not have a job right now. The ratio always drops during recessions, but before 2001, it always climbed to higher highs during the recoveries. 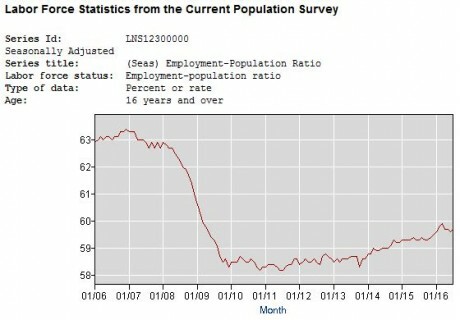 The 2001 recession and subsequent recovery changed this. For the first time, the ratio never fully recovered, never got even close to fully recovering. That was a new phenomenon: employment growth could no longer keep up with population growth. When the Great Recession hit, the ratio plunged from its lower starting point at the fastest pace on record (going back to 1948). The Fed’s efforts were all focused exclusively on bailing out bondholders, re-inflating the stock market, re-inflating the housing market, and generally creating what had become the official Fed policy at the time, the Wealth Effect (here’s Bernanke himself explaining it). This has re-inflated asset prices – many of them way beyond their prior bubble peaks. But the Fed’s astounding focus on capital accelerated the already changing dynamics of the economy, at the expense of labor. Ford, GM and Chrysler — three of the U.S.’ largest auto companies — reported sales for July that missed estimates: down 3%, 1.9% and up 0.3%, respectively. Delta Airlines, one of the largest airlines in the world, said revenue fell 7% in July as part of its monthly performance update. Macy’s, the biggest department store company, reported a decline in sales for July, leading to more aggressive markdowns and an industry-wide sell-off. The Libor, or London Interbank Offered Rate, measures the interest rate at which banks lend to each other at different durations, and its sharp jump was a harbinger of the financial crisis. In the past month, the Libor rate has spiked to rates not seen since the first quarter of 2009, the heart of the banking meltdown. Not to mention, the spread between the Libor and the Overnight Index Swap rate, which tracks the lending rate from the Federal Reserve, has widened, another potentially worrying sign. But of course I have been quoting facts and figures like this for months, and yet U.S. financial markets continue to hold it together. There are literally dozens of parallels between the global financial crisis of 2008 and what is happening in 2016, but Wall Street continues to defy the laws of economics. Of course it won’t last forever, but it certainly has been a sight to behold. For the moment, investors continue to pay extremely irrational prices for stocks, and the mainstream media is just giddy about the state of the economy. So let us enjoy this very strange period of stability for however much longer it lasts, but let us also protect ourselves from the horrible crash that will inevitably follow.